The Madriu-Perafita-Claror Valley is a pastoral landscape reflecting an agricultural way of life that was once widespread in the upland regions of Europe, but now survives only in this part of the Pyrenees. The valley was a place of passage with tracks linking it into France and Spain. Shepherds, charcoal burners, miners, blacksmiths, farmers and even smugglers have used these footpaths over the centuries. 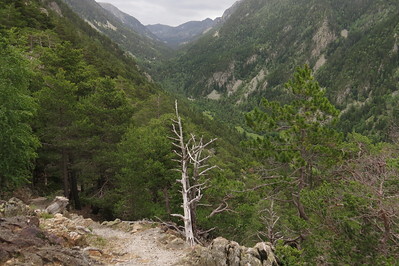 It is the only surviving unspoilt landscape in Andorra, no roads lead into the valley. Due to the rapid development of the rest of Andorra as a shopping and skiing mecca, Madriu is seen as its ‘spiritual heart’. The valley corresponds with the Madriu river basin. Its highest part is a glacial landscape. The rest of it was and still is used as pastures for the grazing of cows and horses during the summer. 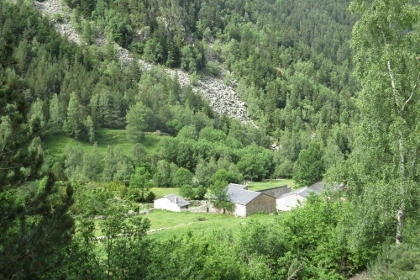 There are two settlements within the valley, with 12 houses in total and only used in the summer months. Terraced fields have been constructed to grow rye, wheat and to provide hay. The land is communally owned. This WHS can only be reached on foot: there are no roads leading into the core zone. I started from the kiosk just below the Hotel Camp del Serrat at the Lake of Engolasters (where I stayed overnight). The kiosk gives away hiking maps, and I was handed one focused on the Madriu Valley including explanations on why it’s a WHS and what’s to see. So the Andorrans must have improved on advertising their only site on the List. There still are no signs however, so you’ll have to do without souvenir pictures of yourself posing before a “Welcome to Madriu WHS” signboard. I had chosen to do the Fontverd route, a 13km hike to the Fontverd plateau which has a refuge and a cabin. This route partly follows the red-and-white striped GR-11 long distance path into the valley. The trail is easy to find and you do not really need a map. What I did use the map for is to look for some 'things to see' in the valley of cultural value. They are few and far between: some Orri (shepherd's huts) are shown, but all are deep into the mountains and not near to any of the easier hiking trails. So I just decided to enjoy the walk and let the surroundings surprise me. The core zone starts from the Col Jovell, about 45 minutes into the hike and after a steep ascent. Just over the edge of this mountain ridge is the best viewpoint into the valley itself (see large photo above): until that point it is hidden behind various forested mountains. The valley is remarkably narrow. With the zoom lens of my camera I could spot some stone buildings in the distance. What looks like a little church actually is the 20th century hydroelectric system, where the Madriu river provides 11% of Andorra’s electricity. The river also supplies 20% of the nation’s drinking water. The trail into the valley is narrow and rocky. I passed terraced fields with drystone walls and some abandoned farms. The cultural link of this WHS is a thin one: it’s a good thing that this last “original” piece of Andorra is saved from commercial exploitation, but I wonder how alive the pastoral tradition really is. And the trail could do with some interpretative signs. Maybe some future reviewer with better mountain hiking skills than I have could go just a bit deeper into the valley: the next point on the trail is “La Farga” where there are remains to be seen of the early steel industry in the valley. I wonder how much of that is visible. Just when I reached my finish at the Fontverd plateau, it started to rain. I sheltered for a while in the refuge (where you can stay overnight too). But the dark clouds kept on coming so I headed back. I took the yellow-dotted trail back to Col Jovell, this one is easier as it involves less climbing. But the effect of pouring rain on myself and the rocky path gave this excursion a tough 1h45min ending. In all it was a nice half-day walk with some fine mountain scenery, but not a brilliant WHS. I visited this WHS in April 2017 with my wife and dog. Signage seems to have improved since the visits of previous reviewers, as there's now at least a "Welcome to the WHS" sign (two of them, in fact!). We drove our car up to the hotel at the top of Engolasters and parked in their parking lot, before walking into the forest. It's about 90 minutes walk from here to the start of the site, and it's a very pretty trail through pine forest, over rocks and through a small tunnel as well. 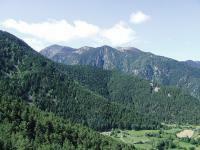 For most of it there are great views back to the city of Andorra La Vella. There is a look-out at the border of the actual world heritage area from where you can see most of the valley, but since all three of us were tired we took some photos and decided to turn back. Pressing on would have required a serious downhill walk and then a serious uphill walk as well! You can see some evidence of the shepherd's huts and trails from this vantage point, albeit at quite some distance. Overall it's not the greatest site we've been to so far, though if we'd started earlier and been fitter we might've found it more interesting! Read more from Joel on the Road here. 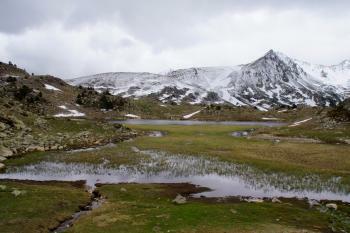 The Madriu-Perafita-Claror valley is the last remnant of a pastoral landscape in Andorra, whereas the rest of the small country has developed during the past decades almost entirely in a ski resort and a shopping paradise for bargain hunters. 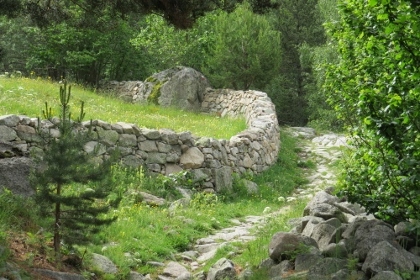 The valley has been preserved mainly because it is connected with the rest of Andorra only by small paths, there are no roads. We visited the valley in May 2014. 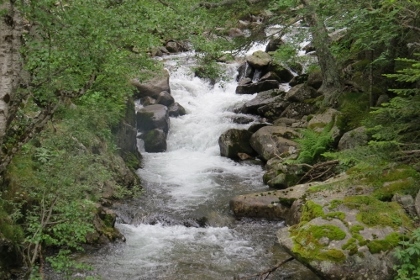 The tourist website of Andorra suggests several hiking routes within the inscribed area, we had chosen the Madriu valley route: a 13.5 km route starting in Les Elcades alongside the Madriu river up to the Lake Bova, and on the same route back. We started our hike at the old Pont d'Escaldes and followed the Carni de la Muntanya uphill. This section is already in the core zone of the WHS. After one kilometre, near the crossing of the Road Cornella I de la Plana and the Road to Engolasters, we reached the area of the National Park. An information board explains the flora and fauna of the valley, but there is no WHS sign. The route runs constantly uphill, in the first two thirds on a stone paved path, certainly convenient in the past for donkeys and mules, but strenuous for hikers, in particular downhill and as on our tour, because the stones were slippery from the rain in the night before. We passed drystone walls, terraced fields and huts, but we've seen no cattle and no shepherd. The valley was almost deserted, we met only a few other hikers and some locals who worked on the renovation of a farmhouse. It is surprising to find such a remote area in short distance to the busy traffic and the crowded city. After one and a half hours we came to the hamlet Ramio, one of the two settlements in the valley, and after another 45 minutes we reached the Fontverd refuge. This section is identical to a part of the route described by Els above. After Fontverd we saw more huts and a few buildings that could be the remains of the iron smelting, but I'm not sure. In the last section of the trail we left the Madriu river and walked uphill to the Lake Boca (photo) at a height of 2400 metres, rather a wetland covered with cattails. It was a special atmosphere, a bit sombre and melancholy, due to the windy and cloudy weather and due to the fact that we were all alone, no other hikers and no sound, only now and then the cry of a vulture or an eagle and our own voices. Another 30 minutes uphill and we came to the Lake Illa at the eastern end of the core zone. Then we went back on the same route. It is not a brilliant WHS and the mountain scenery is more impressive in the Mont Perdu WHS that we visited a few days before, but we enjoyed our day-trip. The capital Andorra la Vella is not worth to visit, the historic centre consists of the Casa de la Vall, the seat of the Andorran Parliament, and a few narrow streets around. The rest of the city looks more like the duty free zone of an airport than a lively city centre. I visited this WHS in May 2014. There was no information apart from a few hiking trail signs and no sign anywhere informing people that this is a WHS or indeed a national park for that matter. Over the internet I found a list of different trails that do pass from the main core zone of this WHS and since I didn't want to spend days of hiking after having visited the Ordesa Valley a couple of days before, I opted for the shorter hike from Encamp to Engolasters which offers a couple of panoramic views and a few streams of water from the melting snow on the mountain peaks. In Engolasters, at 1616 metres, there is a lake in a glacial depression with clear turqoise water and plenty of fish. There's also a small church originally built in the 11th-12th century called Sant Miquel d'Engolasters which is very similar to the ones in the Val de Boi in Catalonia, Spain. Those were the main highlights of my visit together with the many birds of prey present in the valley. More effort should be made by Andorra to provide some information boards along the various hiking trails and to promote this WHS instead of only promoting the many shopping centres only. I visited Andorra in July 2008, and also found little information about accessing the WHS at the Tourist Office. But I did find a minibus that went from Escaldes to Engolasters, a resort high in the mountains. From here there were a number of marked trails through the forest, one of which led to a viewpoint from where there was a panorama of the Madriu Valley. I visited this site in August 2008. The weather was very pleasant with lots of sunshine and a cooling breeze at higher levels. This site is also a National Park, which is (I think) co-terminous with the WHS.However I found no WHS plaque nor acknowledgement of its NP status.I saw no NP staff, nor interpretative material of any sort, only a very few footpath signs (tho' the system of paint flash waymarks was mostly very good) and no signs of agriculture or forestry. What few buildings there were seemed to be abandoned and there appears to be no public vehicular access. This is a cultural site but nothing seems to be done to tell the visitor what (s)he is looking at. Given the Andorran predeliction for covering all available land with shopping centres and/or ski resorts the cynical might conclude that this area was recognised as too remote and too steeply sloping to have any such potential and therefore designated as a NP and WHS in the hope of bringing in the tourists and their money that way. To try and get a feel for the site I had decided to follow a route which a leaflet from the Tourist Office told me had a Difficulty rating of "Medium to High" and involved a climb of 970m. With an hours walk at the beginning and end to and from Escaldes to the Start point I anticipated quite a tough day. Having been a bit grumpy so far in this review I want to say that I thoroughly enjoyed the day. Unsurprisingly the early part requires a long slog upwards, made pleasant by the attractive mixed woodland thro' which one passes. At Entremesaigues I took a right turn into the smaller Perafita valley, eventually emerging from the trees into the sunlit uplands. Here there are two refuges, both pretty squalid, and from where my onward route was not clear. Fortunately 4 other walkers arrived with a good map and pointed me in the right direction. At this level the sight of marmots and their surprisingly loud squeaks can be enjoyed. Here I was happy to relax with a beer or two in a friendly cafe before getting the bus back to my lodging. So, to summarise I had had an uplifting trek thro' beautiful and almost deserted, scenery (which I'd whole-heartedly recommend) but I'd have learned more about the changing way of life in a marginal upland area from a day's walk in the North Pennines.